Note: Not all offers will credit for everyone, and some may have to be tried repeatedly with a different email. Also, remember to clear cache and cookies if doing the same type of offer again. [Prizerebel]- Redeem promo code: AVNUXVDU - 5 pts - enter this in the "raffle" ticket icon on the top right hand corner of the menu toolbar. Expires Quick. [InstaGC]- Dryverless Ads - eBates - 19.6 pts - Sign up with email and password, submit, and let it sit - credits within a min. [InstaGC]- Adgate Rewards (order by: newest) - Survey Voices - Quick Side Income - 57 pts - Enter your email and submit. Leave the page open. This offer always likes a new email. - credits within 2 mins. [InstaGC]- Dryverless Ads - Lancome - 11.2 pts - Enter email twice, submit, and let it sit - credits within a min. [InstaGC]- Acorn - Lifescripts X7 (email only submit type) - 37 pts each ($2.59 total) - Fill out email and submit. Let it sit on the next page. I used chrome, refreshed the acorn wall and then cleared cookies with the vanilla cookie manager in between tries. You do have to retry these a few times, but most credited after trying for three times. If it doesn't work try again at a later time (see the how to get lifescripts to credit guide) - Credits within 30 sec. [InstaGC]- Radium One - eBates - 23 pts - Sign up with email and password, submit, and let it sit - credits within a min. [InstaGC]- Acorn - Reconnect With Old Friends: Classmates Sign up - 43 pts - Choose city, choose high school, then register with valid info and submit, and let it sit on next page - credits instantly. [InstaGC]- Acorn - Dailybreak: Improve Your Mood With Windex Outdoor! - 7 pts - Create a new account or sign in, click on picture to start, complete all quizzes and use "skip" & "next" when necessary, and leave last page open. May have to be repeated with different email, and clear cookies, history and cache beforehand.- Credits within a min. [InstaGC]- Kiwi wall - RewardBee - Religious Survey - 6.2 pts - fill out all info to sign up or sign in with old account, choose answers to questions, choose two magazines or click "save for later", and submit, let it sit on reward bee sign in page (don't sign in)- credits within 3 mins. [Swagbucks]- Offer toro (sort:newest) - Daily Break - Sam's Club Movie Night - 12 SB - Create a new account or sign in, complete all quizzes and use "skip" & "next" when necessary. May have to be repeated with different email, and clear cookies, history and cache beforehand.- credits within a min. [Swagbucks]- Adgate Media- Insurance Branch X3: v37, 38, 41 - 4 SB each - input zip code, and submit - credits within a min. [InstaGC]- Main instaGC wall - Daily Breaks X2: Unilever Deo Made Simple CVS + UbK Fitness at Walgreens - 15 pts each - Create a new account or sign in, complete all of the quiz and use "skip" & "next" when necessary, click on "get started" button, and leave last page open. May have to be repeated with different email, and clear cookies, history and cache beforehand.- Credits within a min. [InstaGC]- Main instaGC wall - Petcentric Newsletter - 20 pts - Enter all info on first page, submit, and let it sit. - Credits instantly. [InstaGC]- Adwall - Rewardbee (X3): love, gun, religion - 19.32 pts each - fill out all info and/or choose password, answer questions, enter address and name, complete captcha, and click on "no thanks" 2 times. If you want the magazines, then choose two of them and click "submit & get reward" button (they actually DO send the magazines for FREE). Then, let it sit on reward bee confirmation page (don't sign in) - credits within 1 min. [InstaGC]- Offer Toro (newest tab) - Go Solar! - 58 pts - Fill out all info until you get to the "thank you for your request.." page. Let it sit. - Credits within 1-2 mins. [Prizerebel]- Redeem promo code: XGFMVU1P - 7 points - enter this in the "raffle" ticket icon on the top right hand corner of the menu toolbar. Expires Quick. [InstaGC]- Radium One (sort low to high) - JustFab - 23 pts - Click on "get started" button, answer all quiz questions, fill out name, email and password, click "complete" and let it sit - credits within 10 mins. [InstaGC]- Acorn (new wall just added) - Coupon Print - 17 pts - Print 3-4 coupons, then let it sit. See my guide to printing coupons here - Credits within 30 mins. [InstaGC]- Acorn (new wall just added) - Insurance Branch (many available) - varies from 6 to 11 pts each - Put in your zip code and submit, let page load, and let it sit. - may cap quickly so it's best to do in the morning/afternoon. delayed credit. - credits within 2 mins. [InstaGC]- Acorn (new wall just added) - Únete a la comunidad de Orgullosa - 26 pts - Register with valid info on first page and submit, and let it sit on next page - credits instantly. [InstaGC]- Offer Toro (newest tab) - Swimsuits for All - 18 pts - Fill out first page and submit. Let it sit. - Credits within a min. help you find... - 12 pts - Create a new account or sign in, complete all quizzes and use "skip" & "next" when necessary, and leave the last page open that says "Way to go! You did it!". May have to be repeated with different email, and clear cookies, history and cache beforehand.- Credits within 1 min. [InstaGC]- Main instaGC wall - Tommy Bahama Sweeps - 20 pts - Click on Tommy Bahama ad banner with woman in picture, enter all info, submit, and let it sit. - Credits instantly. [InstaGC]- Peanut Labs - Collect 100 points and get a....(National Consumer) - 85 pts each (7 of these are avail. )- Click to answer questions, fill in email, and click continue. Let it sit on the next page. Clear cookies and cache in between tries. This is a rinse-and-repeat type of offer, and needs to be repeated with different emails if it doesn't work (most took me 3 tries, but the last two of them took me 10+ tries). I used chrome with the vanilla cookie manager - Credits within 10 sec. [InstaGC]- Peanut Labs - Get FREE samples of...(Get Samples) - 85 pts each (5 of these are avail. )- Fill in email on first page, and click continue. Let it sit on the next page. Clear cookies and cache in between tries. This is a rinse-and-repeat type of offer, and needs to be repeated with different emails if it doesn't work (most took me 3 tries, and these did credit faster than the national consumer types above). I used chrome with the vanilla cookie manager - Credits within 10 sec. [InstaGC]- Main instaGC wall - Lifescripts: Nat Geo Main Page + Habit Main Page - 25 pts each ($0.50 total) - Fill out all info on first page and submit. Let it sit on next page. I used chrome, cleared cookies with the vanilla cookie manager. I did retry these offers multiple times while I did other offers. If it doesn't work try again at a later time (see the how to get lifescripts to credit guide) - Credits within 30 sec. [InstaGC]- Adwall (sort: newest) - QuizFactory New York Skyscrapers Quiz US - 24.15 pts - Click to start quiz, click next/continue, choose the following answers: 1. One World Trade 2. Empire State 3. Chrysler 4. Bank of America 5. One 57 6. Woolworth 7. 30 Rockerfeller 8. NY Times 9. 40 Wall St 10. 8 Spruce 11. Trumpworld Tower 12. MetLife 13. One Worldwide Plaza 14. Time Warner 15. JP Morgan 16. GM 17. Sony 18. Morgan Stanley 19. 225 Liberty 20. 432 Park. When finished with quiz, click "continue" and share to facebook (may have to share 2X). The trick is after sharing on facebook, refresh the last quiz page 4-6 times - Credits instantly. [InstaGC]- Check your email - Special Email Offer: Renewal by Anderson - 150 pts - Go to the email that you used to sign up for instagc (make sure mailing list option is turned on here), find the email that has the subject "Special email offer", click on the link and fill out all the pages until it says that someone will contact you (I used a google voice number) - Credits within 1 min. 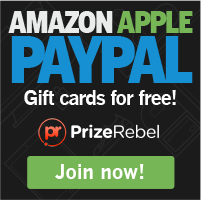 [Prizerebel]- Redeem promo code: AELERB0Q - 5 points - enter this in the "raffle" ticket icon on the top right hand corner of the menu toolbar. Expires Quick. [Prizerebel]- Redeem promo code: BX63NJSI - 6 points - enter this in the "raffle" ticket icon on the top right hand corner of the menu toolbar. Expires Quick. [Prizerebel]- Trial Pay Offer - Rewardbee - 10 points - fill out all info, answer questions, enter address and name, complete captcha, and click on "no thanks" 2 times. Then, let it sit on reward bee sign in page (don't sign in) - credits within 2 mins. [Prizerebel]- Redeem promo code: ITESGPUO - 5 points - enter this in the "raffle" ticket icon on the top right hand corner of the menu toolbar. Expires Quick. [InstaGC]- Adgate Rewards - X16 Lifescripts: Email submit type - 46 pts each ($7.36 total) - Input email and submit, and let it sit. I used chrome, cleared cookies with the vanilla cookie manager. I did retry these offers multiple times while I did other offers. If it doesn't work try again at a later time (see the how to get lifescripts to credit guide) - Credits instantly. [InstaGC]- Main instaGC wall - Daily Break - Coke / March Madness - 15 pts - Create a new account or sign in, complete all of the quiz and use "skip" & "next" when necessary, click on "get started" button, and leave last page open. May have to be repeated with different email, and clear cookies, history and cache beforehand.- Credits within a min. [InstaGC]- AdWall (click the "quiz" category) - Quiz Factory Game of Thrones US - 33.81 pts - Click to start quiz, next, click continue when needed, choose the following answers: 1) Robert Baratheon 2) Wealthiest 3) The Iron Islands 4) Braavos 5) Faith of the Seven 6) Wylis 7) A Three Headed Dragon 8) Essos 9) Kingdom of the Andals 10) Catelyn Stark 11) Arryn 12) Drogon, Rhargal, Viserion 13) For Selling Slaves 14) Needle 15) Ice 16) Little Birds 17) A falcon 18) All of the above 19) Samwell Tarly 20) Euron. When finished with quiz, click "continue" and share to facebook. The trick is after sharing on facebook, refresh the last quiz page 4-6 times (may have to share to fb 2X) - Credits within 3 mins. [Prizerebel]- Redeem promo code: KCNIQECM - 6 points - enter this in the "raffle" ticket icon on the top right hand corner of the menu toolbar. Expires Quick. [Swagbucks]- The Spring Reading Team Challenge is underway. Join the fun and earn up to a 50 SB bonus!- 10-50 SB Rebate on your Next Cash Out - Click the "Join" button to start here (http://www.swagbucks.com/spring-reading), and complete as many tasks as you can - The challenge begins Monday, March 20th at 8am PT/ 11am ET and ends on Friday, March 24th at 12PM PT/ 3PM ET. [Prizerebel]- Redeem promo code: VDO2R8EE - 6 points - enter this in the "raffle" ticket icon on the top right hand corner of the menu toolbar. Expires Quick. [Prizerebel]- Redeem promo code: 23Z5KDON - 5 points - enter this in the "raffle" ticket icon on the top right hand corner of the menu toolbar. Expires Quick. [Prizerebel]- Redeem promo code: WX7OEAYH - 6 points - enter this in the "raffle" ticket icon on the top right hand corner of the menu toolbar. Expires Quick. [InstaGC]- Adwall (sort: newest) - Glucerna Coupon - 6.9 pts - Click on glucerna coupon banner, and let it sit - Credits within a min. [InstaGC]- Peanut Labs - Choose Insurance: Are you in need of life insurance Take this survey to find the right type of insurance for you. - 106 pts each (4 of these are avail. )- Click through all questions, fill in zip code, fill in email, and submit. Let it sit on the page with the "search sponsored listings" button. Clear cookies and cache in between tries. Took many tries at different time of the day. - credits within 3 mins. [InstaGC]- Dryverless Ads (Click more to see this wall) - Print Coupons- Daily - 10.08 pts - Print 3-4 coupons, then let it sit. See my guide to printing coupons here - Credits within 10 mins. [InstaGC]- AdWall - Insurance Branch: Auto Insurance 7 US - 11.37 pts - Put in your zip code and submit, let page load, and let it sit. - may cap quickly so it's best to do in the morning/afternoon. delayed credit. - credits within 2 mins. [InstaGC]- Adgate Rewards (order by: newest) - SavingStar - 11 pts - Click on "Sign up" button, fill out email and password, and click yellow "start saving" button. - credits within 2 mins. [Prizerebel]- Redeem promo code: SUNDAYFUN1 - 10 points - enter this in the "raffle" ticket icon on the top right hand corner of the menu toolbar. Expires Quick. [InstaGC]- Dryverless Ads (Click more to see this wall) - Coupons - Print - 11.2 pts - Print 3-4 coupons, then let it sit. See my guide to printing coupons here - Credits within 10 mins. [InstaGC]- Adgate rewards - Want To Visit Alaska? - 46 pts - Answer yes to question, fill in email and submit, click on alaska ad banner, on next page fill in info up to the zip code, scroll down to skip optional survey questions, and click submit - credits instantly. [InstaGC]- Main instaGC wall - Shermans Travel - 20 pts - Enter email and zip, click sign up, choose your preferences, and submit. - credits within a min. [Prizerebel]- Adscend - Insurance Branch Medicare X6 - 30 points total - Enter zip code and then click on Get Quotes. Really easy offer to complete - credits in 1 min. [InstaGC]- Adgate Rewards (order by: newest) - Excedrin: The Headache Expert - 13 pts - Enter email, enter birthday with day first, month, and year. Enter name, gender, country, check yes box, and submit. - credits instantly. [InstaGC]- Main instaGC wall - Medicare Insurance I & II - X2 each 5 pts - Put in your zip code and submit, let page load, and let it sit. - Credits within a min. [Prizerebel]- Redeem bonus code: O0RSUCBH - 5 points - enter this in the "raffle" ticket icon on the top right hand corner of the menu toolbar. Expires Quick. [InstaGC]- Adgate - IMVU - 46 pts - Click on yellow button that says "choose your free avatar", choose a character, fill in all info, and click to sign up. Let it sit on the next page - instant credit. [InstaGC]- Main instaGC wall - Fabletics - 25 pts - Click on "get started" button, answer all quiz questions, fill out name, email and password, click "complete" and let it sit - credits within 5 mins. [InstaGC]- Main instaGC wall - Shoe Dazzle - 25 pts - Click on "get started" button, answer all shoe quiz questions, fill out name, email and password, click "complete" and let it sit - credits within 5 mins. [InstaGC]- Main instaGC wall - Choose Interest - Coupons - 25 pts - Click through all questions, fill in zip code, fill in email, and submit. Let it sit on the page with the "search sponsored listings" button. Clear cookies and cache in between tries. Mine worked on chrome with a newish gmail, and took many tries at different time of the day. - credits within 3 mins. [InstaGC]- Main instaGC wall - eBates Cashback - 20 pts - Sign up with email and password, submit, and let it sit - credits within a min. [InstaGC]- Main instaGC wall - X2 Banner Lifescripts: Atkins Banner and L'Oreal Hydra-Genius Banner - 25 pts each - Input email and submit, and let it sit. I used chrome, cleared cookies, history and cache beforehand. I did retry these offers multiple times while I did other offers. If it doesn't work try again at a later time - Credits within a min. [InstaGC]- Check Email - Special Email Offer: Invention Land - 150 pts - Go to the email that you signed up with for instagc (make sure mailing list option is turned on here), find the email that has the subject "Special email offer", click on the link and fill out all the pages with real info and give an invention idea that you have, and let the last page sit that says "thank you" - Credits within 2 mins (some said in chat that it credited after 1 hr). [Prizerebel]- Redeem bonus code: YV7YXWWZ - 5 points - enter this in the "raffle" ticket icon on the top right hand corner of the menu toolbar. Expires Quick. [InstaGC]- Main instaGC wall - Asthma Health - 30 pts - click on ad banner on right hand side about asthma, on new page that pops up fill out all info, click submit, and let it sit on the next page - Credits within a min. [InstaGC]- Main instaGC wall - AARP Travel Sweeps - 30 pts - Register with AARP, click on "register" button, and let it sit on the page that plays a video - Credits within a min. [InstaGC]- Wall ads (click the "quiz" category) - Try Dailybreak and get $1 Off Ben and Jerry @ Walmart - 15 pts - Create a new account or sign in, complete all quizzes and use "skip" & "next" when necessary, click on "get started" button, and leave last page open. May have to be repeated with different email, and clear cookies, history and cache beforehand.- Credits within a min. [InstaGC]- Wall ads (click the "quiz" category) - How much do you know about Christmas? Take the free quiz! - 30 pts - Click to start quiz, click continue when needed, choose the following answers: 1. Over 500 lbs. 2. Kiss 3. White Christmas 4. Romans 5. England 6. 16th Century 7. Star 8. Charles Dickens 9. Oregon 10. December 11. Franklin Pierce 12. 113 ft. 13. North Pole 14. Father Frosty 15. Myra. When finished with quiz, click "continue" and share to facebook (may have to share 2X). The trick is after sharing on facebook, refresh the last quiz page 4-6 times - Credits within 3 mins. [Prizerebel]- Redeem bonus code: PresDay2017 - 5 points - enter this in the "raffle" ticket icon on the top right hand corner of the menu toolbar. Expires Quick. [InstaGC]- Adwall (sort: newest) - QuizFactory Valentine's Day Trivia - 16.56 pts - Click to start quiz, choose the following answers: 1. Saint Valentine's 2. hugs 3. feb 14th 4. roses 5. Aphrodite 6. dove 7. hallmark 8. Ares 9. telephone 10. sailor 11. tomato 12. 15% 13. 8 billion 14. $75 15. 100 million. When finished with quiz, click "continue" and share to facebook (may have to share 2X). The trick is after sharing on facebook, refresh the last quiz page 4-6 times - Credits instantly. [InstaGC]- Main instaGC wall - Healthy Matters Coupon - 10 pts - Click on print coupon, and let it sit - credits within a min. [InstaGC]- Offer Daddy (Click more to see this wall) - Get free printable coupons now from Coupons.com - 12 pts - Print 3-4 coupons, then let it sit. See my guide to printing coupons here - Credits within 10 mins. [InstaGC]- Persona.ly - Dailybreak:SCJ/Transform Your Home/Home Depot - 13.9 pts - Create a new account or sign in, complete all quizzes and use "skip" & "next" when necessary, and leave last page open. May have to be repeated with different email, and clear cookies, history and cache beforehand.- Credits within a min. [InstaGC]- Offer Toro (newest tab) - Dailybreak: Unilever/Ben and Jerry Slices - 12 pts - Create a new account or sign in, complete all quizzes and use "skip" & "next" when necessary, and leave last page open. May have to be repeated with different email, and clear cookies, history and cache beforehand.- Credits within a min. [Prizerebel]- Redeem bonus code: 71H71K3V - 5 points - enter this in the "raffle" ticket icon on the top right hand corner of the menu toolbar. Expires Quick. [InstaGC]- Main instaGC wall - Choose Insurance Services: Auto/Life/Health/Home - X4 400 pts each 100 pts - First delete "Choose Insurance..." app from facebook settings apps section (ignore this step if it doesn't exist), clear cookies, click on offer, go through questions and sign up with facebook, choose continue, click on the "search sponsored listings" button, click on white underlined "search" word, on pop up window click on any link, keep clicking until you get to an actual website, and let it sit. Make sure to erase the "Choose insurance.." app from facebook settings and clear history in between tries. Mine worked on Chrome and Firefox. - Credits within 2 mins. [InstaGC]- Main instaGC wall - Nutrition Bar Coupon - 10 pts - Click on print coupon, and let it sit - credits within a min. [InstaGC]- Offer Toro (newest tab) - Insurance Branch: Refi + Health - X2 each 8 pts - Put in your zip code and submit, let page load, and let it sit. - Credits within a min. [InstaGC]- Main instaGC wall - eBates - 20 pts - Sign up with email, submit, and let it sit - credits within a min. [InstaGC]- Main instaGC wall - Daily Break - SCJ Home Depot (9511) - 15 pts - Create a new account or sign in, complete all quizzes and use "skip" & "next" when necessary, and leave last page open. May have to be repeated with different email, and clear cookies, history and cache beforehand.- Credits within a min. [InstaGC]- Main instaGC wall - Pampers Rewards Join - 25 pts - Enter baby bday and submit, on next page fill out all info, click on "create your profile," and then let it sit on the next page. - Credits within a min. [Prizerebel]- Redeem bonus code: H2K3FBHX - 5 points - enter this in the "raffle" ticket icon on the top right hand corner of the menu toolbar. Expires Quick. [InstaGC]- Adgate Rewards - Disney Vacation Planner - 46 pts - Fill out the first two pages, and then let it sit on next page where the video plays. - Credits instantly. [Swagbucks]- The Chocolate Dipped Team Challenge is underway. Join the fun and earn up to a 50 SB bonus!- 10-50 SB Rebate on your Next Cash Out - Click the "Join" button to start here (http://www.swagbucks.com/chocolate-dipped), and complete as many tasks as you can - Begins Monday, February 13th at 8am PT/ 11am ET and ends on Friday, February 17th at 12PM PT/ 3PM ET. [Swagbucks] - Revenue Universe, Offer Toro, Radium One - Coupon Printing - 6 SB/ 10 SB/ 4 SB - Print 3-4 coupons each time you do the offer, then let it sit. See my guide to printing coupons here - Credits within 10 mins. [InstaGC]- Peanut Labs (sort by: newest) - Earn vc by signing up for Dailybreak and Find out how you should spend your Valentines... - 12 pts - Create a new account or sign in, complete all quizzes and use "skip" & "next" when necessary, and leave last page open. May have to be repeated with different email, and clear cookies, history and cache beforehand.- Credits within 2 mins. [InstaGC]- Peanut Labs (sort by: newest) - Register with valid information to receive FREE coupons discounts and cashback from your favorite restaurants and to get vc!- 50 pts - Enter email, submit, sign up with info, and submit once more, then let it sit- Credits within 5 mins. [Prizerebel]- Redeem bonus code: DHF5DWKL - 5 points - enter this in the "raffle" ticket icon on the top right hand corner of the menu toolbar. Expires Quick. [InstaGC]- Main instaGC wall - Target Baby Registry - 65 pts - Sign up to create a new account, click "skip tour", add baby info, add 1-3 things to registry, and let it sit - Credits within 6 mins. [InstaGC]- Main instaGC wall - Daily Break - KY Valentine's Day (9514) - 15 pts - Create a new account or sign in, complete all quizzes and use "skip" & "next" when necessary, and leave last page open. May have to be repeated with different email, and clear cookies, history and cache beforehand.- Credits within a min. [InstaGC]- Adwall - Dailybreak SCJ/Transform Your Home US - 16.56 pts - Create a new account or sign in, complete all quizzes and use "skip" & "next" when necessary, and leave last page open. May have to be repeated with different email, and clear cookies, history and cache beforehand.- Credits within 2 mins. [InstaGC]- Main instaGC wall - Daily Break - Unilever Walmart (9513) - 15 pts - Create a new account or sign in, complete all quizzes and use "skip" & "next" when necessary, and leave last page open. May have to be repeated with different email, and clear cookies, history and cache beforehand.- Credits within a min. [InstaGC]- Peanut Labs (sort by: newest) - Which gym do you prefer? Take a survey and get $1000 towards a gym membership! - 50 pts - Answer all questions, and then submit email (I used an old sbcglobal.net email), after that let it sit. May have to be repeated multiple times. Clear cookies, history and cache beforehand.- Credits instantly. [InstaGC]- Main instaGC wall - Macmillan eDeals - 10 pts - Input email and submit, and let it sit - Credits within a min. [InstaGC]- Adwall (sort by: newest) - X3 Lifescripts: HBO US, Chipotle US, and Jack in the Box - 48.3 pts each - Fill out info, check two boxes in each question, answer all yes and click on submit button. I used chrome, cleared cookies, history and cache beforehand. I did retry these offers multiple times while I did other offers. If it doesn't work try again at a later time - Credits instantly. [Swagbucks]- Adgate Media - Eat Out, Pay Less! - 44 SB - Enter email, submit, sign up with info, and submit once more, then let it sit - credits within a min. [Prizerebel]- Redeem bonus code: NFIMXTY9 - 7 points - enter this in the "raffle" ticket icon on the top right hand corner of the menu toolbar. Expires Quick. [InstaGC]- Adgate Rewards - Auto Insurance Branch - X2 each 9 pts - Put in your zip code and submit, let page load, and let it sit. - may cap quickly so it's best to do ASAP. - credits within 2 mins. [Swagbucks]- Collector's Bills "Valentine's Day" Search Bonuses- 5, 7, 9, 14, 21 SB - Use the swagbucks search engine to conduct your regular searches to be able to win random collector's bills. It is active from February 06 - February 13. [InstaGC]- Main instaGC wall - Heart Health Awareness - 30 pts - click on ad banner on right hand side about heart health, click red "join now" letters, fill out all info, submit, and let it sit on the next page - Credits within a min. [InstaGC]- Kiwi wall - Fit Tea $120 New Years - Email Submit, US - 57.35 pts - Answer all questions, and then submit email (I used an old hotmail), after that let it sit. May have to be repeated multiple times. Clear cookies, history and cache beforehand.- Credits within a min. [InstaGC]- Adwall (sort by: newest) - Lucky 7 Prizes US - 101.4 pts - fill in email, submit, and let it sit. It worked for me on the first try, but may have to be retried many times. - Credits instantly. [InstaGC]- Adgate Rewards (order by: newest) - E-File.com Tax - 36 pts - Fill out info on 1st page, choose security answers, click "save answers," and let it sit - Credits within 2 mins. [InstaGC]- Main instaGC wall - X2 Banner Lifescripts: Del Taco & McDonalds - 25 pts each - Input email and submit, and let it sit. I used chrome, cleared cookies, history and cache beforehand. I did retry these offers multiple times while I did other offers. If it doesn't work try again at a later time - Credits within a min. [InstaGC]- Peanut Labs (sort by: newest) - BE THE FIRST TO KNOW SIGN UP FOR EMAIL UPDATES SAMPLE OFFERS AND MEMBER ONLY SPECIALS. - 9 pts - Input email and click "sign me up! ", then let it sit - Credits within 3 mins. [InstaGC]- Peanut Labs (sort by: newest) - Get 2 FREE Chicken Tacos from Del Taco! - 32 pts - Fill out info, check two boxes in each question, answer all yes and click on submit button. I used chrome, cleared cookies, history and cache beforehand. If it doesn't work try again at a later time - Credits instantly. [InstaGC]- Personaly - Support Betsy Devos - 81.2 pts - Fill out all the required info and submit, let it sit. Can only do this offer once. - credits within 2 mins. [Prizerebel]- Redeem bonus code: K9DDEU82 - 5 points - enter this by hovering over the "raffle" ticket icon on the top right hand corner of the menu toolbar. Expires Quick. [InstaGC]- Adwall - X2 New Lifescripts: Del Taco & McDonalds - 48.3 pts each - Fill out info, check two boxes in each question, answer all yes and click on submit button. I used chrome, cleared cookies, history and cache beforehand. I did retry these offers multiple times while I did other offers. If it doesn't work try again at a later time - Credits instantly. [InstaGC]- Dryverless Ads - File Your Taxes - 16.8 pts - Register with name and email, and let it sit - Credits within 2 mins. [InstaGC]- Peanut Labs (sort by: newest) - Play for a chance to win $150,000.00 Dream Car Instantly - 71 pts - Enter email and submit, then let it sit. I used a yahoo email and cleared cookies and cache beforehand - Credits within a min. [InstaGC]- Peanut Labs (sort by: newest) - FREE HOROSCOPE FROM ASTROLOGIST. PLAY YOUR FREE LUCKY NUMBERS... FOR LIFE (Guide) - 71 pts - Enter email and submit, enter name and birthday, submit, and then let it sit on the offers page. I had to retry this offer many times, and cleared cookies and cache in bet. tries. It credited on 5th day - Credits within a min. [InstaGC]- Adgate Rewards - Star Colony - 92 pts - Click play now, sign up to play using social media or email (I chose email), create user/password/email, and start playing, follow the tutorial for about 2-5 mins, and check to see if you got credit for the game on instagc - credits instantly. [InstaGC]- Adgate Rewards - Credit Coaching Network - 11 pts - fill out all info, submit, and let it sit on the next page - credits instantly. [InstaGC]- Adwall (sort by: newest) - MS Guide Social US - 33.81 pts - fill in email, name, and choose "I'm living with relapsing MS and taking treatment", click on get guide now, let it sit - credits within a min. [InstaGC]- Wallads (sort category: new) - Daily Break: Take and complete a fun quiz, view the SC Johnson 2016 Sustainability Report... - 14 pts - Create a new account or sign in, complete all quizzes and use "skip" & "next" when necessary, and leave last page open. May have to be repeated with different email, and clear cookies, history and cache beforehand. - credits within 3 mins. [InstaGC]- Adwall - Rewardbee - 19.3 pts - fill out all info, answer questions, enter address and name, complete captcha, and click on "no thanks" 2 times. Then, let it sit on reward bee sign in page (don't sign in) - credits within 2 mins. [InstaGC]- Peanut Labs (sort by: newest) - Sign up for a complimentary one year digital subscription! - 5 pts - Scroll down, fill out all info, submit, and let it sit - Credits within a min. [InstaGC]-Adgate Rewards - Medicare Insurance Branch v3 & Medicare Insurance Branch v2 - X2 each 9 pts - Put in your zip code and submit, let page load, and let it sit. - may cap quickly so it's best to do ASAP. - credits within 2 mins. [InstaGC]- Peanut Labs (sort by: newest) - Click on the banner to download the coupon and get Points! - 5 pts - Click on glucerna coupon ad banner, and let it sit - instant credit. [InstaGC]- Offer Toro - Super Bowl Trivia - 27 pts - Click to start quiz, answers: 1. OJ Simpson 2. Joe Montana 3. Randy White & .... 4. James Harrison 5. Willie Parker 6. Tony Dorset 7. Devin Hester 8. 17 9. Jerry Rice 10. Tom Brady 11. Mike Lodish 12. John Elway 13. 1967 14. Rod Martin 15. Chuck Howley. At the end click "continue" and share to facebook (may have to share 2X). The trick is after sharing on facebook, refresh the original quiz page 4-6 times - delayed credit. credits within 10 mins. [Prizerebel]- Redeem bonus code: FUNZ5DOP - 5 points - enter this by hovering over the "raffle" ticket icon on the top right hand corner of the menu toolbar. Expires Quick. [InstaGC]- Main instaGC wall - Credit Coaching Network - 10 pts - fill out all info, submit, and let it sit on the next page - credits instantly. [InstaGC]- Main instaGC wall - Everyday Family Diaper Sweeps - 30 pts - Scroll down, fill out all info, submit, and let it sit on the next page - credits within 2 mins. [InstaGC]- Dryverless Ads - Atkins $5 Off - 16.8 pts - Select yes, email, submit, click on atkins coupon banner ad, then on new page input: info, choose username and password. On the right side choose the "no kit, thanks" unless you want to download the kit. - credits within 2 mins. [InstaGC]- Peanut Labs (sort by: newest) - Work when and where you want, earning more than $1,000 in 90 days.....AVON offer - 27 pts - Fill out all info, click "continue", and let is sit on the next page. - credits within a min. [InstaGC]- Peanut Labs (sort by: newest) - Free Beauty Classes at Sephora and Free Samples! (Lifescript) - 37 pts - Fill out email and click on submit button, and let it sit. I used chrome, cleared cookies, history and cache beforehand. May have to retry multiple times - credits within a min. [Prizerebel]- Redeem bonus code: LTXLYSHJ - 6 points - enter this in the "raffle" ticket icon on the top right hand corner of the menu toolbar. Expires Quick. [InstaGC]- Main instaGC wall - Daily Break - Cough and Cold Season - 20 pts - Create a new account or sign in, complete all quizzes and use "skip" & "next" when necessary, and leave last page open. May have to be repeated with different email, and clear cookies, history and cache beforehand.- credits within a min. [InstaGC]- Kiwi wall - Dailybreak: SCJ Sustainability - 13.64 pts - Create a new account or sign in, complete all quizzes and use "skip" & "next" when necessary, and leave last page open. May have to be repeated with different email, and clear cookies, history and cache beforehand.- credits within 10 mins. [Swagbucks]- Super Rewards in discover section (filter using "free offers") - Credit Pros - 24 SB - input name, email and phone number, click on "fix my credit" and let it sit - credits within 10 mins. [Swagbucks]- Revenue Universe - 3X Daily Breaks - Wet Ones, SCJ Sustainability, Belvita/Walmart - 15 SB each - Create a new account or sign in, complete all quizzes and use "skip" & "next" when necessary. May have to be repeated with different email, and clear cookies, history and cache beforehand.- credits within a min. [InstaGC]- Peanut Labs (sort by: newest) - From significant hotel discounts to.....Shermans Travel's hand-picked deals - 53 pts - Enter email and zip, click sign up, choose your preferences, and submit. - credits within a min. [InstaGC]- Main instaGC wall - Tum-E Yummies Coupon - 10 pts - Scroll down on page, Enter all info, click sign up, and let it sit. - credits within a min. [InstaGC]- Revenue Universe - Coupons.com Print - 8 pts - Print 3-5 coupons to pdf, virtual printer, or real printer, and let it sit. I used Chrome- credits within 10 mins. [InstaGC]- Revenue Universe - 3X Daily Breaks - Wet Ones, SCJ Sustainability, Belvita/Walmart - 16 + 16 + 16 pts - Create a new account or sign in, complete all quizzes and use "skip" & "next" when necessary. May have to be repeated with different email, and clear cookies, history and cache beforehand.- credits within a min. [InstaGC]- Wallads - Get $20 in Reward$ to spend IMMEDIATELY! (Used "NEW" filter) - 12 pts - fill out all info, answer questions, enter address and name, and click on submit or "no thanks." Then, let it sit on reward bee sign in page (don't sign in)- credits within 2 mins. [InstaGC]- Look for email from instaGC using the email that you log in with - Special Email Offer-Comparably - 50 pts - Sign up with email and answer job questions. FYI, it credited instantly for me after confirming email, choosing password and submitting the personal questions. [InstaGC]- Main instaGC wall - 2X Daily Breaks - Ritz / Walmart & Uncrustables - 10 + 10 pts - Create a new account or sign in, complete all quizzes and use "skip" & "next" when necessary. May have to be repeated with different email, and clear cookies, history and cache beforehand.- credits within a min. [Swagbucks]- Revenue Universe - Insurance Branch Mortgage Zip Submit: Get rates as low at 2.5% on your home loan! - 4 SB - input zip code, and submit - credits within a min. [Swagbucks]- Revenue Universe - CheapInsurance.com - Life: Compare Life Insurance Options To Find Coverage That Fits Your Budget. - 15 SB - input zip code, and click on "Find Coverage", click on one or a few insurance offers - credits within a min. [Swagbucks]- Revenue Universe - CheapInsurance.com - Homeowners: Compare Homeowners Insurance Options To Find Coverage That Fits Your Budget. - 15 SB - input zip code, and click on "Find Coverage", click on one or a few insurance offers - credits within 2 mins. [Swagbucks]- The Swag Slopes Team Challenge is underway. Join the fun and earn up to a 50 SB bonus!- 10-50 SB Rebate on your Next Cash Out - Click the "Join" button to start here (http://www.swagbucks.com/swag-slopes), and complete as many task squares that you can - Ends at noon PT on Friday, January 27th! [InstaGC]- Revenue Universe - Thrive Market Newsletter: Get your favorite organic and non GMO foods direct to your door! - 13 pts - Click "thrive" ad banner, submit email, click "start shopping", choose a password, click "start shopping" once more, ok, done! - credits within a min. [InstaGC]- Peanut Labs - Save $$$ on Your Mortgage. Rates as low as 2.5% (2.68% APR) - 11 pts - Put in your zip code and submit, let page load, and let it sit. - may cap quickly so it's best to do ASAP - credits within a min. [Prizerebel]- Adscend - Insurance Branch Medicare - 8.25 points - Enter zip code and then click on Get Quotes. - credits in 2 mins. [Prizerebel]- Redeem bonus code: RPLIYUY5 - 5 points - enter this in the "raffle" ticket icon on the top right hand corner of the menu toolbar. Expires Quick. [InstaGC]- Wallads - You Smart Enough? Can you solve these New Year's Resolutions Puzzles? - 8 pts - Click "start now", keep clicking "next" to go to the next one. Answers: Drink Less, Travel More, Help Others, Lose Weight, Quit Smoking, Get New Job, Save Money, Exercise More, Find Love, Enjoy Life. Click "next" once more 'til you get to page with all the answers in red, and refresh the last page at least four times, and let it sit - Credits within 5-10 mins. [InstaGC]- Wallads - Can you Solve these Star War Puzzles? May the force be with you! - 8 pts - Click "start now", keep clicking "next" to go to the next one. Answers: Luke Skywalker, Darth Vader, George Lucas, Han Solo, Darth Maul, Chewbacca, Anakin Skywalker, Obi Wan Kenobi, Princess Leia, Rey. Click "next" once more 'til you get to page with all the answers in red, and refresh the last page at least four times, and let it sit - Credits within 5-10 mins. [InstaGC]- Wallads - Can you unscramble the names that go with the faces of these movie stars that we all know and love? - 8 pts - Click "start now", keep clicking "next" to go to the next one. Answers: 1. Tom Hanks 2. Julia Roberts 3. Harrison Ford 4. Will Smith 5. Angelina Jolie 6. Dwayne Johnson 7. Cameron Diaz 8. Paul Walker 9. Anne Hathaway 10. Johnny Depp. Click "next" once more 'til you get to page with all the answers in red, and refresh the last page at least four times, and let it sit - Credits within 3 mins. [InstaGC]- Wallads - Here are our Top 10 Reasons to use Coconut Oil Every Day! - 17 pts - Click through slideshow by clicking on "start with number 10" and then "continue with number #" in blue words, at the end refresh the last page at least four times, and let it sit - instant credit after refreshing the 4th time. [InstaGC]- Adwall - Top 10 Female Lead Characters on TV - 28.98 pts - Click through quiz by clicking on the next slide in blue words, at the end click share to facebook, post it to facebook (the FB page will close automatically). Refresh the original end page at least four times, and let it sit - instant credit after refreshing the 4th time. [InstaGC]- Adgate (sort using category: apps) - Game of War (android)- 736 pts - Must be first time user. download game on mobile device, play game until you get to level 10 stronghold. - instant credit. [InstaGC]- Adwall - Glucerna Coupon - 6.9 pts - Click on glucerna coupon banner, and let it sit - instant credit. [Swagbucks]- Adgate - 40 Things I Wish I Had Known About MS - 22 SB - input: name and email. Click on "Get Guide Now" - credits instantly. [Swagbucks]- Discover<"sign up and earn" section - Win a Free Trip to LA - 5 SB - Sign up for sweepstakes, let it sit - credits instantly. [Swagbucks]- Discover<"Popular Offers" section - Boom Chicka Pop Coupon - 10 SB - Click print coupon, open pdf downloaded, on "allow this?" click yes, go back to original browser page, and let it redirect you automatically to "thanks..." page, let it sit. - credits within a min. [Prizerebel]- Redeem bonus code: GEKXWHGI - 7 points- enter this in the "raffle" ticket icon on the top right hand corner of the menu toolbar. [InstaGC]- Peanut Labs - RewardBee: Get 20 in Reward to spend IMMEDIATELY! - 14 pts - fill out all info, answer questions, enter address and name, and click on submit or "no thanks." Then, let it sit on reward bee sign in page (don't sign in)- credits within 2 mins. [InstaGC]-AdWall- Insurance Branch Offers (mobile and PC)- varies bet. 9.6 to 19.32 pts - Put in your zip code and submit, let page load, and let it sit. - may cap quickly so it's best to do in the morning/afternoon. delayed credit. credits within 2 mins. [InstaGC]- Main instaGC wall - Shermans Travel Top 25 Deals - 10 pts - This worked for me only on mobile, but should try on desktop first. Enter email and zip, click sign up, choose your preferences, and submit. - credits within a min. [InstaGC]- Main instaGC wall - Life Script: AC Makeup Banner - 25 pts - fill in email and submit, let it sit. I cleared cache and cookies beforehand. May have to retry multiple times at different times of day- credits within 5 mins. [InstaGC]- Main instaGC wall - iOwnAHome Mortgage Refinance - 60 pts - Enter all info and continue to sign up until you get to the "Almost Done...Final Step...Check Your Scores!" screen, let it sit on this page. This offer caps quickly! - credits within a min. [InstaGC]- Adgate (sort using category: newest) - Glucerna - 4 pts - Click on glucerna coupon banner, and let it sit - instant credit. [InstaGC]- Peanut Labs - Sign up for Ebates today and shop with access to online rebates and coupons to over 1200 stores. - 48 pts - Sign up for ebates and let it sit - credits within a min. [InstaGC]- Peanut Labs - Lifescript: Register and Get a FREE Scoop of Ice Cream at Baskin Robbins! - 32 pts - Fill out info, check two boxes in each question, answer all yes and click on submit button. I used chrome, cleared cookies, history and cache beforehand. May have to retry multiple times - credits within a min. [InstaGC]- Peanut Labs - Lifescript: Get a FREE sample of LivRelief Pain Relief Cream! - 32 pts - Fill out info, check two boxes in each question, answer all yes and click on submit button. I used chrome, cleared cookies, history and cache beforehand. May have to retry multiple times - credits within a min. [InstaGC]- Dryverless Ads (under "load more" category on homepage) - Auto Protection - 42 pts - Enter all info under "start here", click "view coverage", let it sit. - credits within 3 mins. [Swagbucks]- Swago Board Winter Edition Bonus- 5-300 SB - Click the "Join" button to start your swago board here (http://www.swagbucks.com/swago), and complete as many task squares that you can, once you complete what you can, submit your best (can only submit once). - going on from January 16 at 9AM PT through January 23 at 12PM PT. [InstaGC]- Peanut Labs - Billshark: Register and start using 3 Easy Steps to Saving 25% or more on all of your bills. - 170 pts - Click "start saving", choose email & password, click "go", enter all info and last 4 of SSN, upload a pic of one of your bills (e.g. electric bill), click "next", leave next page options alone and click "finish" - credits within a min. [InstaGC]- Peanut Labs - How well do you know the flags of the world? Take this quiz to find out. - 35 pts - Click to start quiz, answers: canada, uk, japan, germany, mexico, russia, norway, netherlands, iceland, china, maldives, south sudan, UAE, albania, kenya. At the end click "continue" and share to facebook. The trick is after sharing on facebook refresh the original quiz page 4 times - delayed credit. credits within 4 mins. [InstaGC]- Adgate (sort using category: apps) - Mobile Strike (android)- 809 pts - Must be first time user. download game on mobile device, play game until you get to level 10 headquarters. - instant credit. [InstaGC]- Main instaGC wall - MS Guide Social - 30 pts - fill in email, name, and choose "I'm living with relapsing MS and taking treatment", click on get guide now, let it sit- credits within a min. [Swagbucks]- Trialpay (sort using "free") - KeepHomeSecure Insurance- 80 SB - Click choices to answer all four questions. Enter zip code, click "yes" green button, enter email, click "compare quotes" button, and lastly click "yes" on pop up. Let it sit - May have to retry at different times of day. credits within a min. [Prizerebel]- Redeem bonus code: LLQJPY9N - 5 points- enter this in the "raffle" ticket icon on the top right hand corner. [InstaGC]- Main instaGC wall - Insurance Branch Health Zip & Insurance Branch Home Zip - 5/5 pts - Put in your zip code and submit, let the page load completely until you see the insurance offers and let it sit. - both offers credit within 2 mins. [InstaGC]- Dryverless Ads (under "load more" category on homepage) - Shermans Travel - 16.8 pts - Enter email and zip, click sign up, choose your preferences, and submit. - credits within a min. [InstaGC]- Main instaGC wall- RewardBee Politics - 15 pts - fill out all info, answer questions, choose two magazines, enter info, and click on submit or "no thanks." Then, let it sit on reward bee sign in page (don't sign in)- credits within 5 mins. [InstaGC]- Dryverless Ads (under "load more" category on homepage) - Shadowverse - 42 pts - Click the red "steam" button, then leave all pages open and alone. I used chrome - credits within 2 mins. [Swagbucks]- Most popular ways to earn category - Free Atkins Quick-Start Kit - 10 SB - input: info, username and password. On the right side choose the "no kit, thanks" unless you want to download the kit. - credits instantly. [InstaGC]-Revenue Universe- "Insurance Branch: Protect your home for as low as $44 a month!" - 6 pts - Put in your zip code and submit, let the page load completely until you see the insurance offers and let it sit. - credits within 2 mins. [InstaGC]- AdWall - Insurance Branch: Home Insurance US (Mobile Only)- 13.80 pts - Put in your zip code and submit, and let it sit. - may cap quickly so it's best to do in the morning. credits within 2 mins. [InstaGC]- Main instaGC wall - Headaches - 20 pts - Click on the Excedrin ad banner on the right side. Enter email, enter birthday with day first, month, and year. Enter name, gender, country, check yes box, and submit. - credits instantly. [InstaGC]- Peanut Labs - How well do you know the shapes of countries? We bet we can stump you. - 71 pts - Click to start quiz, answer all 25 correctly, at the end click "continue" and share to facebook. You may have to refresh the last page a few times - delayed credit. credits within 10-15 mins. [InstaGC]- Main instaGC wall - Healthy Living - 15 pts - Click on the P&G banner on the right side, Register with valid info, leave tab open, and let it sit - credits within 10 mins. [InstaGC]- Main instaGC wall - Atkins Free Quick-Start Kit - 15 pts - input: info, username and password. On the right side choose the "no kit, thanks" unless you want to download the kit. Clear cookies beforehand- credits within 2 mins. [InstaGC]- Revenue Universe - Shermans Travel - 16 pts - This worked for me only on mobile. Enter email and zip, click sign up, choose your preferences, and submit. - credits within a min. [InstaGC]- Peanut Labs - Get a free month of Hulu! Participation required. - 41 pts - Fill out info, check two boxes in each question, answer all yes and click on submit button. I used chrome, cleared cookies, history and cache beforehand. May have to retry multiple times - credits within a min. [Swagbucks]- Most popular ways to earn category- Sign up for MS guide! - 25 SB -fill in email, name, and choose "I'm living with relapsing MS and taking treatment", click on get guide now, let it sit- credits instantly. [Prizerebel]- Redeem bonus code: F4VVFQFQ - 6 points- enter this in the "raffle" ticket icon on the top right hand corner. [InstaGC]-AdWall- "InsuranceBranch - Life Insurance" - 9.66 pts -Put in your zip code and submit, and let it sit. - may cap quickly so it's best to do this fast. - credits instantly. [Swagbucks]- Revenue Universe or Most popular ways to earn category- HomeFree - 12 SB - fill out zip code and all info, answer no to all the questions until you reach the "congrats" page, let it sit - delayed credit, credits within 5 mins. [InstaGC]- Revenue Universe - Kickstart your low carb weigh loss program by signing up and get $5 off! - 13 pts - Select yes, email, submit, click on atkins coupon banner ad, on new page input: info, username and password. On the right side choose the "no kit, thanks" unless you want to download the kit. It worked for me in IE, clear cookies beforehand- credits within 2 mins. [InstaGC]-AdWall- InsuranceBranch - Life Insurance (Distribution 1) US- 13.8 pts -Put in your zip code and submit, click on one insurance result, and let it sit. - may cap quickly so it's best to do in the morning/afternoon. delayed credit. credits within 5 mins. [InstaGC]- Main instaGC wall - Daily Break - Nabisco at Kroger - 20 pts - Create a new account or sign in, complete all quizzes and use "skip" when necessary. May have to be repeated with different email, and clear cookies, history and cache beforehand.- credits within a min. [InstaGC]- Main instaGC wall - Daily Break: Tyson Playoff - 20 pts - Create a new account or sign in, complete all quizzes and use "skip" when necessary. May have to be repeated with different email, and clear cookies, history and cache beforehand. - credits within a min. [InstaGC]-AdWall- InsuranceBranch - Mortgage Insurance 2 US (Mobile Only)- 19.32 pts -Put in your zip code and submit, and let it sit. - may cap quickly so it's best to do in the morning. delayed credit. credits within 5 mins. [InstaGC]- Peanut Labs - Get your free gym access here! Participation required. - 41 pts - Fill out info, check two boxes in each question, answer all yes and click on submit button. I used IE, cleared cookies, history and cache beforehand. May have to retry multiple times - credits within a min. [InstaGC]- Revenue Universe - DailyBreak: Take a fun quiz and save on Nabisco snacks at Kroger! - 11 pts - Create a new account or sign in, complete all quizzes and use "skip" when necessary. - credits within a min. [InstaGC]- Revenue Universe - DailyBreak: Take a fun quiz and save on Tyson products at Sams's! - 11 pts - Create a new account or sign in, complete all quizzes and use "skip" when necessary. - credits within a min. [InstaGC]-Radium One- Dieting Options - 15 pts - Click on atkins coupon banner ad, on new page input: info, username and password. On the right side choose the "no kit, thanks" unless you want to download the kit, and submit- credits within a min. [Swagbucks]- Swago Board Shopping Edition Bonus- 5-200 SB - Join the swago board (http://www.swagbucks.com/swago), and complete as many task squares that you can, once you complete what you can, submit your best (can only submit once). Personally, I always get the perimeter pattern for 25 SB since it's the easiest and FREE - going on from January 09 - January 12. [InstaGC]- Revenue Universe - Enter your zip code to see how you can save on a Life Insurance policy! - 11 pts - Put in your zip code and submit, and let it sit. Credits within 5 mins. [InstaGC]-Main instaGC wall- Atkins Weight Loss - 20 pts - input info, username and password. On the right side choose the "no kit, thanks" unless you want to download the kit, submit. - credits within a min. [Prizerebel]- Redeem bonus code: NNMTIEUO - 7 points- enter this in the "raffle" ticket icon on the top right hand corner. [Swagbucks]- Discover<Trialpay<more<games and entertainment - Game of War (android)- 160 SB- Must be first time user. send download link to phone number/email, download game, play game. follow my tutorial guide here so you can reach level 5 stronghold fast- instant credit. [InstaGC]- Main instaGC wall- MS Injection Treatment - 65 pts - Click on blue ad banner that says "Be bold...", fill out info on new page and answer questions; create email, password and security Q's, click "submit," and let it sit. (has a daily cap and may have to retry the next day) - credits within a min. [InstaGC]- Radium One- My Unemployment Helper - 12 pts - Click on "My unemployment helper"ad banner, enter email in new page, click "start now," and let it sit. - credits within a min. [InstaGC]- Main instaGC wall - Life Script - Gym Banner - 25 pts - fill in email and submit, let it sit. I used a gmail email, internet explorer, and cleared cache and cookies beforehand. May have to retry multiple times - credits within a min. [InstaGC]- Main instaGC wall - Low Income Housing Help - 30 pts - Input email, submit, ignore pop ups, choose next twice until you get to the webpage with gov't disclosure at top, and let it sit - credits within 5 mins. [InstaGC]- Peanut Labs - Get FREE Schick Razors! - 32 pts - Fill out info, check two boxes in each question, answer yes and click on submit button. I used IE, cleared cookies, history and cache beforehand. May have to retry multiple times - credits within a min. [InstaGC]- Main instaGC wall - Visit Alaska - 15 pts - fill in info, answer questions, and submit - credits instantly. [Swagbucks]- Collector's Bills "Snow Much Fun" Search Bonuses- 5, 7, 9, 11 , 16, 22 SB - Use the swagbucks search engine to conduct your regular searches to be able to win random collector's bills. going on from January 02 - January 08. [InstaGC]- Main instaGC wall - Life Script - Amazon Prime Banner - 25 pts - fill in email and submit, let it sit. I used IE and cleared cache and cookies beforehand. May have to retry multiple times - credits instantly. [InstaGC]- Main instaGC wall - Life Script: Schick Solo Banner - 25 pts - fill in email and submit, let it sit. I used IE and cleared cache and cookies beforehand. May have to retry multiple times - Credits instantly. [InstaGC]- Main instaGC wall - Veterans Access Petition - 20 pts - fill out all info and click on red "submit letter" button - credits within a min. [InstaGC]- Main instaGC wall (sorted for newest) - Home Insurance Branch - 15 pts - Put in your zip code and submit, and let it sit. Credits within 5 mins. [Swagbucks]- SB Inbox or Most popular ways to earn category- Sign Up For News On Food Hacks! "- 20 SB -click on tbsp ad banner, type email and submit, let it sit- credits within a min. [InstaGC]- Facebook code: ComeOnVideos - 3 pts - Input code in redeem tab, and point booster codes. [InstaGC]- Adwall - 5 easy clicks - 1.38-2.07 pts - Click to open pages, and let them sit for at least 10 mins, you can close them after that- delayed crediting. [InstaGC]- OfferToro - Shadowverse - 38 pts - Click play now blue button and then clicked the red "steam" button on the next page. I used chrome- credits instantly. [InstaGC]-Kiwi wall- Insurance Branch Life ZIP - US- 6.2 pts -Put in your zip code and submit, and let it sit. delayed credit. credits within 5 mins. [InstaGC]-Kiwi wall- Weight Loss Coupons - Up to $5.00 OFF - 17 pts - Select yes, email, submit, click on atkins coupon banner ad, on new page input: info, username and password. On the right side choose the "no kit, thanks" unless you want to download the kit. It worked for me in IE, clear cookies beforehand- credits within 2 mins. [InstaGC]-Main instaGC wall- RewardBee - 15 pts - fill out all info, choose prefer not to answer, choose two magazines, and submit, let it sit on reward bee sign in page (don't sign in)- credits within 5 mins. [InstaGC]-Main instaGC wall- Atkins $5 Off - 30 pts - Click on atkins coupon banner ad, on new page input: info, username and password. On the right side choose the "no kit, thanks" unless you want to download the kit. It worked for me in IE - credits within a min. [InstaGC]-Main instaGC wall- NFL Playoff Challenge - 15 pts -Click on yellow "play now" button, choose "register" in the create a new account area, fill out all info and submit, let it sit- credits within a min. [InstaGC]-AdWall- NowHairStyle Sweepstakes US - 16.56 pts -Fill out name and email, select yes for "are you sure?" wait for new page to load, scroll down and click on "enter to win"ad banner, enter name and email on toasty egg page, click on "enter to win" and let it sit. I used a new gmail email- delayed credit. credits within 5 mins. [InstaGC]-AdWall- InsuranceBranch - Life Insurance US - 20.7 pts -Put in your zip code and submit, and let it sit. delayed credit. credits within 5 mins. [InstaGC]-AdWall- Insurance Branch - Auto Insurance (Mobile Only)- 17.25 pts -Put in your zip code and submit, and let it sit. delayed credit. credits within 5 mins. [InstaGC]-Main instaGC wall- Life Script - Amazon Sweepstakes Banner - 30 pts -Put in your email and submit, and let it sit. May take many tries to get it to credit. Cleared cookies, history and cache in between tries. credits within a min. [InstaGC]-Peanut Labs- Enjoy a free month of Netflix! - 32 pts -Fill out info, check two boxes in each question, answer yes and click on "get my free samples" button. I used IE, cleared cookies, history and cache, and used an old yahoo email- credits within a min. [InstaGC]-Peanut Labs-Try FREE samples of Caffe Monte Coffee for a Limited Time Only! - 32 pts -Fill out info, check two boxes in each question, answer yes and click on "get my free samples" button. I used IE, cleared cookies, history and cache, and used an old yahoo email- credits within a min. [Swagbucks]-Revenue Universe-Lifescript Video Games- 18 SB - Fill out info, check two boxes in each question and click on orange "get my free samples" button. I used chrome and an old yahoo email- credits within a min. [Swagbucks]-PL-Dove sign up-5 SB-enter name and email, go to second page and enter address and answer questions, choose coupon on third page, enter captcha and submit - credits within a min. [Swagbucks]- Discover<Trialpay<more<games and entertainment - Game of War (android)- 320 SB- Must be first time user. send download link to phone number/email, download game, play game by following tutorials until you reach level 5 stronghold - instant credit. [Prizerebel]-AdGate-$5 Off Diet Coupon-20 points-Submit email, click on Atkins banner ad, register with info, I chose the "no thank you coupon" option on the right, and submitted.-credited within 10 min. [Swagbucks]- Discover<"free offers" section - Dailybreak: Enjoy Dinner with Barilla!- 15 SB- sign up for account or log in, complete quiz (press skip when needed) until you get to the last screen saying "congrats." credits within a min. [InstaGC]-Personaly-Dailybreak: Barilla Mix Match Flavor- 13.9pts -sign up for account or log in, complete quizzes (press skip when needed) until you get to the last screen saying "congrats." credits within a min. [InstaGC]-AdGate-$5 Off Diet Coupon-23 points-register with valid info, I chose the "no thank you coupon" option on the right, and submitted.-credited within 1 min. How to play valentine's day quiz 2018 with love? How to get Lifescripts to credit? InstaSwagCash is a blog dedicated to helping those starting out on survey gpt sites like instagc, swabucks, and prizerebel, so that they can quickly earn extra money efficiently from home. This site is meant to be a guide that will financially help those that are unemployed, disabled, college students, retired, and stay-at-home parents.